platform for selling merchandise online. Your profits depend only on how much you sell. No upfront costs and no hidden fees – only great pricing for great quality products! Gain insights into your audience’s shopping habits. 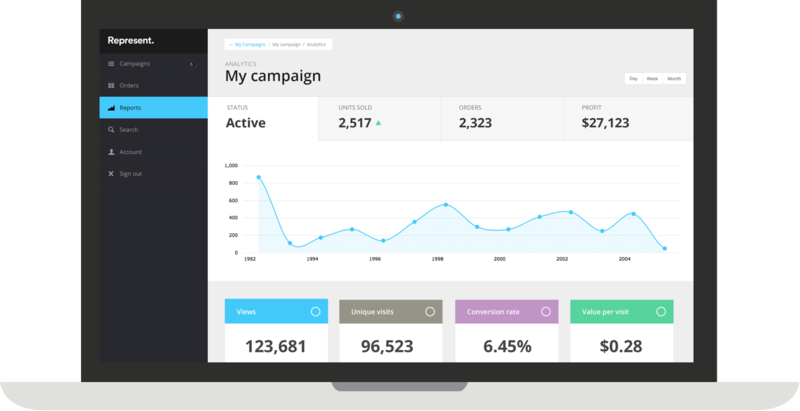 We give you all the information you will ever need at your fingertips - use this information to refine your campaigns and increase ROI and profits. Want to drive traffic to your own site instead of / as well as your Represent campaign page? Simply grab your short embed code and embed a “buy it now” button or campaign widget on your website or blog. We take care of your buyers as if they were our own. From the moment they place their order until they receive their product, our team is there to answer any question and resolve every issue. You have unlimited space beneath your product to explain what makes it special. It’s super easy to include anything from embedded tweets to YouTube videos and images. Promotions let you efficiently explore the right prices for your audience or boost your marketing strategy when you need it. Quickly learn what prices drive the greatest profits for specific niches. Want to re-launch a successful campaign? We thought so, and have made it possible with a single click.